You show the large glass filled with milk. Pour some of the milk into a bag or in a fist. 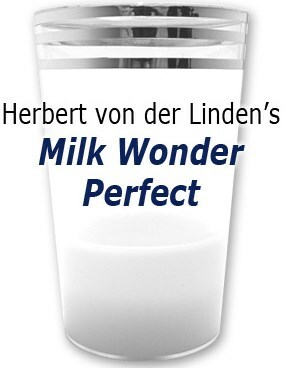 Next, the milk disappears without a trace, but could reappear in the glass again. Or, after every trick, the presenter can take a sip of the milk and have it refilled again and again. The clear glass is made from high quality plastic, has a height of 5.5 inches and top diameter of 3.5 inches. Visible on the main stage.